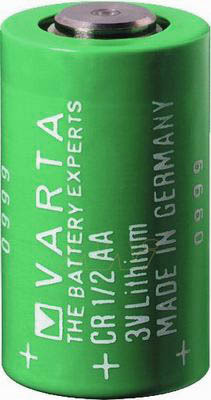 Varta 1/2 AA Lithium battery suitable for many industrial applications. (Non-Rechargeable) Description: Specialised Lithium Battery Cylindrical Cell Application: Memory Back Up (MBU) Product Group: Lithium Chemistry: Lithium Manganese Dioxide Voltage: 3V Nominal Capacity:950mAh Maximum Continuous Discharge Current : 10mAh Brand: Varta Size: 1/2AA Diameter/Width 14.75mm Height 25.1mm Price is per cell! Memory backup battery also suitable for PLC/CNC applications. Suitable for Allen Bradley 1755-L1, 1755-PB720. Replaces Eternacell G04/11, M04/11, Allen Bradley 1755-BAT.